Jowar Flour Recipes, Indian Jowar Flour Recipes. Jowar, also known as white millet and sorghum, is a grain that is usually found in tropical regions. To make the flour, the ripe grain is cleaned, washed, dried and then grinded into a fine powder. Jowar flour is slightly off white in color with a nutty taste. One of the best things about this flour is that it is gluten. With the increase in people who are allergic to gluten, jowar flour acts as a boon. Due to the health benefits of jowar flour, it is advised to be consumed in high quantities, especially instead of refined flour. Many people think it is hard to use jowar in different dishes but it is not so. For breakfast you can make Spicy Oat pancakes with oats, whole wheat flour and jowar flour. Cabbage Jowar Muthias are flavorful, Gujarati dish that is a household favorite. This version of the muthias is healthier as it is high in fiber and very flavorful as well. Healthy Baked Kachodis are also a better option that deep fried ones. These kachoris can be made with numerous filling whether it is a moong dal filling or a vegetable filling. Khakhras are a handy jar snack. They taste perfect accompanied with a hot cup of tea. These crispy treats, even though made with whole wheat flour, can also be made with jowar like the Oats, Methi Multiflour Khakhra. Other jar snacks that can be made with jowar are Moong dal and Jowar Puri, Jowar Til Nimki and Healthy Multigrain Cracker. Everyone loves a dosa but not many people know that they aren’t very healthy. A 4 flour dosa, made with jowar, nachni, bajra and whole wheat flours is healthy and equally delicious. A very traditional item to make with jowar is Jowar Roti. This has been consumed in Gujarati and Maharashtrian since many decades and is generally served with gavar ki subzi. People allergic to gluten have to avoid all kinds of bread. Since jowar does not contain, it can be used to make bread which even allergic people can eat. High fiber multigrain bread is a great option as it is not only gluten free but is also extremely healthy. A chocolate cake is an all-time favorite comfort food which is made with refined flour but did you know you can make a healthy Gluten Free Chocolate Sponge Cake using jowar flour! Even though the cake is slightly dense, it makes up for it in taste. 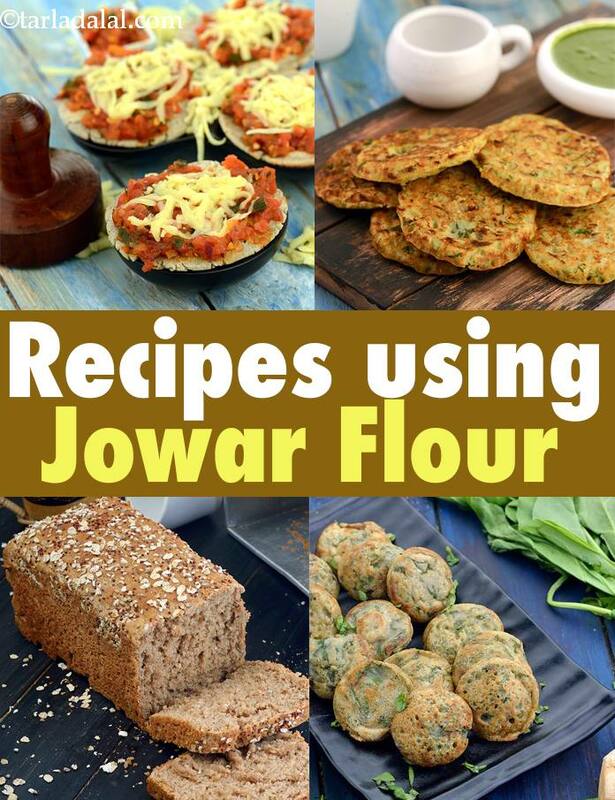 Scroll down below for more Jowar Flour Recipes, Indian Jowar Flour Recipes. Club sandwich, fusion of east and west, this sandwich is truly an unusual combination of whole wheat bread and mixed flour chilas. Nutritious and tasty, enjoy this wholesome snack ideal to pep you up at any time during the day.